Perfect unisex Zodiac Astrology Gift for the Scorpio Sign. 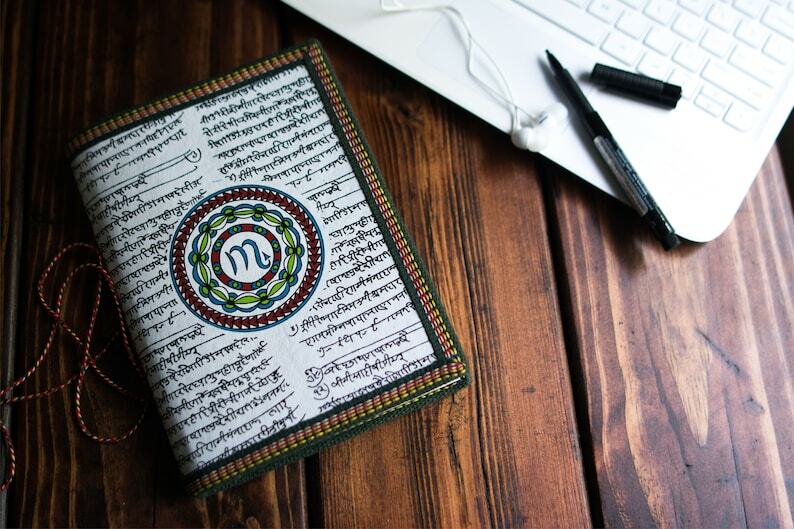 New Zodiac design range launch from Indian Journals. Blank Art Journal made from Recycled Acid Free Handmade Paper consisting natural fibers that are wood free. This is a great big and large journal has plenty of room to write and sketch. This journal contains plain, wood free, recycled acid-free cotton paper which has a smooth luxurious finish. It is suitable for most pencils , pen types, drawing, oil painting and pastels. 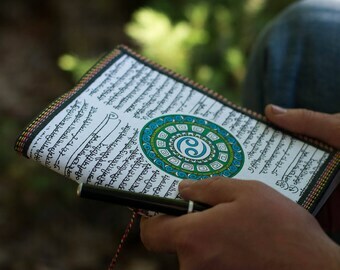 These beautiful journals very versatile gifts and environmentally friendly at the same time. 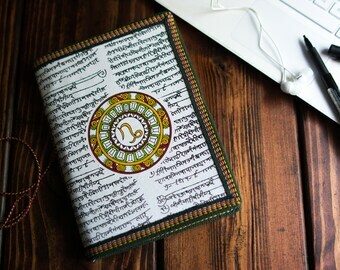 Made from recycled and handmade paper, these diaries are very ornate and unique. They can be gifted to clients, business partners, vendors, people who have started working, who have set-up a new venture, etc. Also can be gifted to students, friends and family. There can be slight variations in the colors and (or) designs due to usage of natural dyes and gum pastes or due to monitor settings. 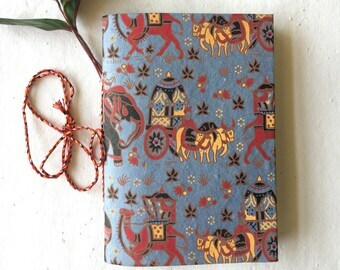 All of my one of a kind Indian Art Journals are made in a smoke free, pet free environment. Beautiful! Even nicer in real life & super fast shipping! Thank you so much! I take PayPal only at this time. The 'other' option is for arranged orders, only use this payment method if it has been discussed. Returns : I will gladly accept returns within 15 days of you receiving the item. However, before deciding to do so, it is best to get in touch with me and we could come with a quicker and better solution. If you must return, kindly send the item back in the exact same condition / sellable condition using registered / post with delivery confirmation. Shipping however is not refunded and the buyer pays return shipping. Custom orders & personalized items are non refundable. If however, the item is not what you had asked for or is damaged, then I will be paying for the return shipping. Exchanges : Yes we can do an exchange. The rules of the exchange are same as that of "Returns" above. Once I receive my item back in the same condition as it was sold, you can get a store credit equivalent of the item (not the shipping) - and you can use this credit to buy any other item(s) that you like. Postage and Deliveries : The nature of postal systems depends on various intermediaries and a package typically passes through many hands. Such events are beyond our control and this is why I am not responsible for lost, wrong address, damaged, returned or stolen items in the mail; or those stuck in customs for whatever reason. I will ALWAYS do what I can to help fix the situation if it occurs. Regular Shipping : I generally ship via Registered Indian Post which has a tracking number and can be tracked via Etsy. Expedited Shipping : I also ship via DHL, TNT , Fedex etc if such an arrangement is required. Although this hardly ever happens, but incase of any import taxes / duties / custom charges- the buyer or the recipient is responsible for the costs incurred. Of course we do ! We have Standard Shipping as well as Expedited Shipping options that suit your needs of the delivery time frame. So what are your delivery time frames ? Standard Shipments are shipped via Registered Indian Postal Services. For most parts of the world, they parcels typically reach within 2 - 4 weeks. However by our statistical data, we have seen 10 - 14 day deliveries in most cases. Expedited shipments are shipped via DHL / FEDEX etc. They ship in 3-6 business days. Both types of shipments are supported with a tracking number. Do you deal in wholesale orders ? We welcome Bulk, Wholesale , Store consignments , Fair and Convention orders. Private Brand Labeling for wholesale customers is an option. Please convo or e-mail me for details. Is there any care information for the journals ? 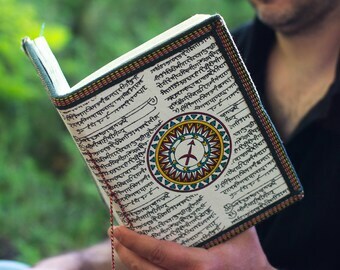 The journals or diaries are not supposed to be washed or wet with water. Wiping with a dry towel to clean is all you may ever need. To fulfil your order, you must provide me with certain information (which you authorized Etsy to provide to me), such as your name, email address, postal address, payment information, and the details of the product that you’re ordering. You may also choose to provide me with additional personal information -for a custom order , for example, if you contact me directly. Extra Large Size is 9 x 7 inches is recently introduced and is observed that people who like to sketch , write for longer duration or use it for specific purposes prefer this size. Large Size is 8 x 6 inches is most preferred by avid journalists. Medium size of 6 x 4 inches as well as Medium Plus of 7 x 5 inches is what sells the best not just because it is easy to carry or use as a handy purse diary, but also because several such journals can be categorized for food, travel, everyday logs, personal notes etc instead of cramming everything in one journal. Mini Size is a cute 3.5 x 5 inches which is generally preferred as a handy book, pocket notebook, quick jotting down journal usually preferred for shopping lists , to do lists etc. How long does it take for the parcel to deliver ? As per the post office, the standard shipping takes 2-3 weeks for most parts of the world, however in my statistical experience, it takes 12-14 days.